Nose: Grape jelly, tart cherry pie filling, cassia, brown sugar, whiff of oak. Palate: Full-bodied and velvety. Overdone cherry pie, allspice, mace. Finish: Chewy, sweet and a little tart. Parting words: Bel Lago has the reputation of being the best cherry wine produced in Michigan. That’s probably because they invented it. Michigan State’s Dr. Amy Iezzoni, wife of Bel Lago founder Charlie Edson, is responsible for bringing the Balaton cherry variety to the US after discovering it in Hungary. The variety’s original name was Ujfehértói Fürtös but Dr. Iezzoni thought Balaton (after Lake Balaton) rolled off the tongue a little better. Her goal was to help break up the Montmorency monoculture in the US. She has succeeded. Balaton produces wine and juice that has more depth and complexity than Montmorency and has the ability to reach wine-like sugar levels of 24 °Bx or so. The wine is lush, complex and velvety in a way that few fruit wines are. There’s no doubt that this is cherry wine, but it transcends the category at a decent price. Bel Lago Cherry Wine is highly recommended. Style: Cherry flavored apple cider. Purchased for $13/750 ml (Michigan by the Bottle Tasting Room, Royal Oak). Growlers available at the winery for $20, with $16 refills. Appearance: Dark pink with light bubbles. Nose: Fresh cut Golden Delicious apples, cherry jello salad. Palate: Effervescent and semi-sweet. Apple juice, cherry cola, fruit salad juice (with cherries of course), slice of Granny Smith. Finish: Crisp, dry and quick. Parting words: I reviewed the Just Apple from Chaos Cider (Verterra Winery by day) back in the fall and I liked it. I like this too. According to a phone conversation with the owner, Cherry Blush starts as cider, then is fermented with a “cherry wine base” (unfermented I assume). This is not a case of adding cherry juice or flavoring to a finished cider. The more complex method shows in the excellent balance here. This isn’t fruit covering up subpar cider, it’s a harmonious blend of cherry and apple. I like it before, during or after a meal. Chaos Cherry Blush is recommended. Palate: Medium bodied. Tart cherries, nectarine, white pepper. Finish: Black cherries slowly morphing into a lingering tartness. Parting words: I don’t recall ever drinking, let alone seeing, an estate grown Michigan cherry wine before this one. Lots of credit to Good Harbor for taking cherry wine seriously and most of all, making a very good one. This is an elegant dessert wine that’s worth every penny. Good Harbor Cherry Wine is highly recommended. Nose: Black cherries, blackberry, hint of leather and clove. On the palate: Medium bodied and slightly tart. Black cherry, black raspberry, allspice. Finish: More tart and long-lasting. Tart cherries, touch of mace. 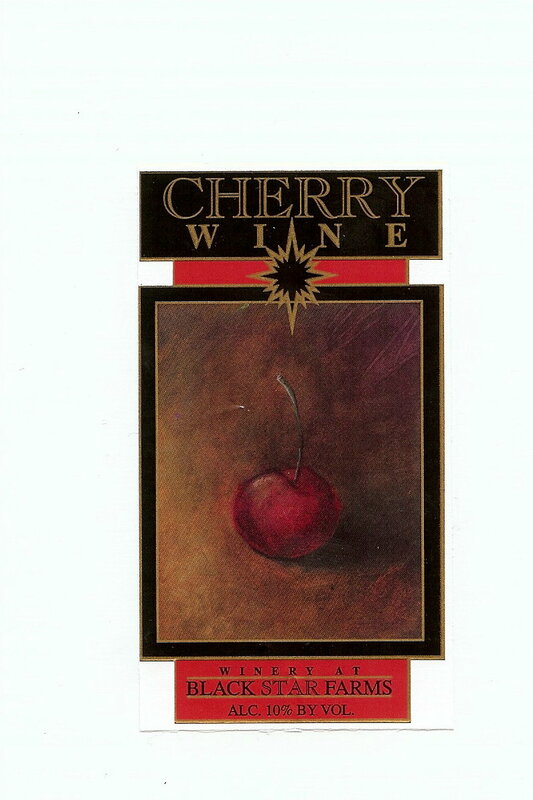 Parting words: I’ve reviewed cherry wines before but it’s been a while. I have never reviewed anything from Gill’s Pier though, so when I saw this in my local grocery store I bought it and gave it a spin. I’ve never been to Gill’s Pier and don’t know much about it other than what is on their website. It was founded in 2002, is located on the Leelanau peninsula and is owned by Ryan and Kris Sterkenburg. Judging by the wines on their website, their emphasis is on white blends with a couple reds as well. The winery was named after a nearby former Czech settlement, which included St. Wenceslaus Catholic Church, now a parish Sutton’s Bay, Michigan. The wine drinks very nicely. It is well balanced and fairly complex for a cherry wine. It’s not quite sweet enough for a a dessert wine, but it’s too sweet and dry to drink with a meal. It probably works best as an after dinner chitchat wine or with a cheese course. It’s not cheap, but it’s one of the better cherry wines I’ve had. Cheerio is recommended. Appearance: Translucent brick red. Like a ruby or unscooped raspberry or cherry jelly in a glass jar. Nose: Slightly tart cherries, sweetness. On the palate: Light-bodied and sweet. Sweet cherries, a touch of tartness. Not much else going on. Finish: Sweet and light. Slightly tart. 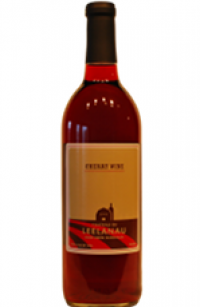 Parting words: After tasting what Black Star Farms, Chateau Chantal and St. Julian do with their cherry wines, Chateau de Leenlenau is a disappointment. It’s not unpleasant. It could hit the spot on a hot afternoon or evening if properly chilled. But Michigan cherry wine can be so much more interesting than this. Sadly this wine was the best one at the tasting room, too. The folks at CDL are nice people, but I can’t bring myself to recommend this wine. There are better options for your cherry wine dollar. Nose: Honey, cherry, not much else. On the palate: Medium-bodied, lighter than expected. Quite sweet. Lots of cherry, with the cherry’s tartness balanced off by the bitter notes from the honey. Honey also adds sweetness, of course and there’s lots and lots of it in here. Also a bit of a concord grape juice taste. Finish: Sweet, not much else. Parting words: This stuff is supposed to be hopped, but for the life of me I can’t find hops anywhere in the mix. To call Funky Monky one-dimensional would be wrong, but it’s not very complex either. Just a lot of cherry with a bit o’ honey. I think they were going for something like a cherry lambic (called a Kriek), given the monk angle. It works as a fun, funky warm-weather dessert wine and it’s priced like one. I just wish there was more going on. Imperial Funky Monky is mildly recommended. Appearance: dark burgundy with broad, slow legs. Nose: tart cherry, wild blackberry, walnut. On the palate: Full-bodied, with a sumptuous mouthfeel. Mildly sweet and mildly tart. Bold, robust cherry flavors with a little clove and allspice. Finish: slightly sweet, tart and tingly. Parting words: Cherry wine and other fruit wines are looked down upon by many connoisseurs as pop wine or a representative of the bad old days of American wine. There are plenty of bad, sickly and cloying fruit wines on the market, granted. In the right hands, though, fruit wines and especially cherry wine (a northern Michigan staple) can be fine dessert wine. A cherry wine will probably never reach the heights of complexity of a decades old vintage Port, but a good one like this can give a ruby a run for its money. Black Star Farms takes what could be little more than a sop to the fudgies and transforms it into something worth drinking. Recommended.